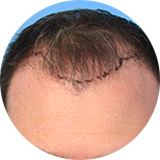 Scalp Micropigmentation (SMP), or trichopigmentation, is a simple skin procedure with minimal downtime or recovery. There are certain steps that have to be taken by a person receiving this treatment in order to ascertain that the procedure is a success as well as minimize any possible complications from the procedure. Below are some simple instructions you need to follow before undergoing an SMP (Scalp Micropigmentation) procedure. You should take a shower before your SMP procedure and wash your scalp with regular shampoo only and avoid using conditioner.